Skills gaps and science, technology, engineering and mathematics (STEM) education are still hot topics in manufacturing. At WMPI, both the younger and female employees – two groups who have been traditionally under-represented in manufacturing – do a wide variety of jobs and come from diverse backgrounds. They also seem to share several motivators: they enjoy learning, they embrace technology, and they value making other people’s jobs easier. WMPI gives them opportunities for all of those things. In WMPI’s metal fabrication department, jobs are coordinated through a front-office team of approximately eight people, several of whom are age 30 or younger, including a female engineer. Emily Hern, 25, works at WMPI as manufacturing engineer while she studies mechanical engineering in her senior year through a UW-Platteville collaborative program. She works more than 30 hours a week in addition to her school work. Emily excelled at math from a young age. In high school she was interested and got involved with the FIRST Robotics mentor-based program. While in college, she learned about an internship available at WMPI and began working there in 2016. Her document control responsibilities include reviewing mechanical drawings and CAD files, comparing them to prints, and working on tool designs. She uses software such as SolidWorks. “I’ve learned a lot that goes beyond classroom content,” Emily said, citing sheet metal processing, for example, which was relatively new to her. She also likes that her tooling design work can help co-workers on the shop floor do their jobs better. “To see it in use is cool,” she said. Tyler Vraney, 23, is a continuous flow specialist in fabrication. He monitors, manages and communicates the status of customer parts and where they are in the manufacturing process. Known as a spreadsheet guru, he confirms quantities, certificates and other information mainly for contract customers. He’s a “numbers guy,” but also likes customer interaction, and that his work saves time for shipping staff, helping make their jobs easier. Tyler graduated in May 2016 from UW-Platteville with a business degree and an accounting minor. He learned of an opening at WMPI through company president Dan Erschen. “It seemed like a good opportunity to do something out of my comfort zone. It’s crazy, but fun.” He also does occasional cost accounting work at WMPI. Justin Nettesheim, 29, manages scheduling and purchasing for the fabrication department. He began at WMPI more than six years ago processing jobs, then worked in the stamping department on the shop floor before moving into shipping and fabrication. “We fill the gap between sales and production, fielding customer questions and vendor calls,” Justin said. “We’re always moving to improve and make jobs easier for the people on the shop floor.” He noted that with WMPI’s high volume of customers to keep track of, it was essential that the fabrication team came up with a process to streamline how parts get made on the floor. Over the past two years or so, the fabrication team has increasingly combined software, spreadsheets, continuous improvement, Kanban and other methods to create a smoother process for each customer. The result has improved efficiency and turnaround times, reduced scrap and rework rates, increased sales volume and improved profitability for customers as well as WMPI. 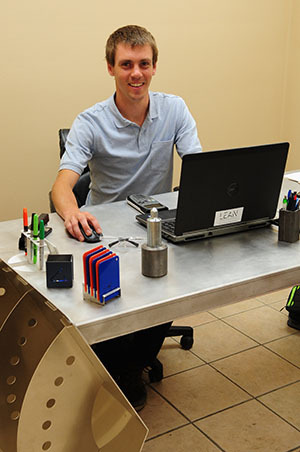 Scott Pease, 29, manages the fabrication front office team. He has a CNC machining and management background as well as a degree in biochemistry with a physics minor. “The different generations bring a balance to the fabricating operation,” Scott said. “It takes just the right group. There’s the incredible knowledge and experience of the people on the floor combined with the younger people. Manufacturing is relatively new to most of them, and they’ve taken a lot of interest in it. They’ve worked hard and developed software to make everything real-time versus paperwork, which is important so floor staff can see what’s coming up. This team works well together, with an open communication approach,” he said. How does a kinesiology degree translate into a manufacturing career? For 25-year-old Jacob Erschen, it didn’t directly. But, after graduating from UW-Madison in 2014, he began working in WMPI’s fabrication department, enjoyed it and decided to continue with it. He has also worked in assembly and other areas. He has added to his degree by taking night school classes in engineering, software and systems and has become more interested in manufacturing systems engineering. Jacob was recently instrumental in implementing offline brake press programming, high-speed brake press technology and automated first article inspection reports within SolidWorks. Women aren’t new to manufacturing. But these days, how are they getting into it, and what careers are they building for themselves? 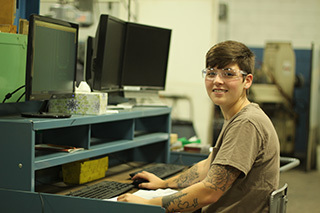 Kelli McCullough, 23, is an apprentice tool and die maker in WMPI’s in-house tool room. She began working there part-time in 2016 while finishing her two-year tool and die diploma at WCTC. Originally a graphic design student, she took a career test which suggested tool and die as a possible career path. McCullough works on the shop floor with journeymen who provide mentoring. Her apprenticeship at WMPI is for five years with a goal to become a journeyman tool and die maker. “Tool and die lets me use creative skills making tools to produce parts,” Kelli said. “I use all kinds of design software, looking at prints, making tools. It may seem out of the norm for women, but it’s interesting and I’m always learning. Tool making produces so many consumer goods and is such an important part of how things are made.” She also makes prototypes for a wide range of industries, such as automotive parts. Samantha Kelly didn’t set out to land in manufacturing, either. The 28-year-old had worked for six years as a hair stylist, but decided a change was in order. She had some shop experience at her family’s machine shop, and she saw a job opening at WMPI in 2016 for part-time, second-shift work. She then worked full time on first shift in the stamping area with assembly, shipping and administrative responsibilities, both on the shop floor and in an office. “I’m taking a class on SolidWorks at WCTC which applies to blueprints, and I’m learning the ERP [enterprise resource planning] system,” Samantha said. She said she appreciates WMPI’s employee benefits such as training, as well as having decision-making abilities in her day-to-day job. Corryn Manderfield, who manages human resources at WMPI, figured she might end up in manufacturing, as both her parents have engineering backgrounds. But her job is all about people. 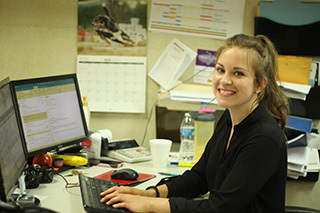 Since she joined the company less than three years ago, WMPI has grown from 76 employees to 105 and counting. A culture of continual growth and employee encouragement combines in-house and technical school training, she said. “Fourteen of our employees recently took a multi-week SolidWorks class at WCTC which was developed for WMPI based on our needs,” Corryn said. “One main goal is to increase efficiency. We’ve also provided other training such as soft skills, leadership, blueprint reading and lean manufacturing, along with online structured training. It’s rewarding to see people’s progress,” she added. 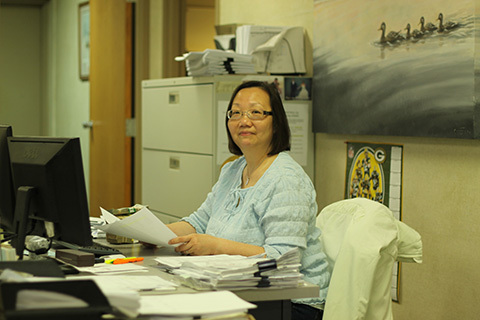 Edna Lee, WMPI’s office and accounting manager, began at WMPI in 2008. Originally from Hong Kong with a banking and accounting background, she also had experience in fragrance manufacturing and assembling lighting fixtures. She later studied cost accounting at WCTC and worked for 11 years in accounting at a manufacturer before the 2008 recession. At WMPI she is closer to the manufacturing process and is highly knowledgeable about the company, its equipment, and where to find an answer if she doesn’t know it. Edna has brought her daughter to work to show her what she does, and offers some wise career advice for women of any age. “Find out what you’re good at and interested in – they work together to help you grow. Consider and see lots of things. Technical school is important to learn details you may never hear about in other academic settings,” she said. Edna epitomizes many of the qualities of successful employees at WMPI, no matter their generation or gender. She finds manufacturing interesting, likes the variety of work and staying busy, is driven by continuous improvement, and says she is never bored. 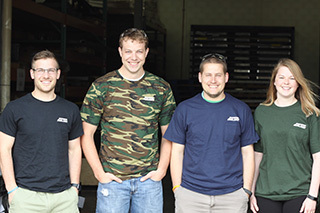 Wisconsin Metal Parts, Inc. was founded in 1988 as Die Concepts, Inc. and renamed in 2010 to reflect a wider range of metal parts solutions. WMPI has 105 employees, three shifts, and more than 75,000 total square feet of manufacturing space in Waukesha, where it provides CNC machined parts, sheet metal fabricating, prototype metal stampings, production of metal stampings and tool and die making. The company is ISO 9001:2015 certified and specializes in producing parts that require multiple forms of production, such as stampings that require secondary services such as grinding, machining, assembly, laser cutting, forming, welding and others. WMPI focuses on helping future generations build their skills, education and strengths, while utilizing advanced technology to provide a more secure future for its team. The goal is to ensure these employees will be knowledgeable resources for their customers now and into the future.